In need of cooking inspiration? Look no further! Our inventive community creates fabulous recipes, and we choose the best one each week to cook, photograph, and publish for the world to taste. If you’d like your own recipe to be featured, send it to community@kitchenstories.com. If you’re at a Chinese restaurant, there’s one soup that’s never missing from the menu: egg drop soup. 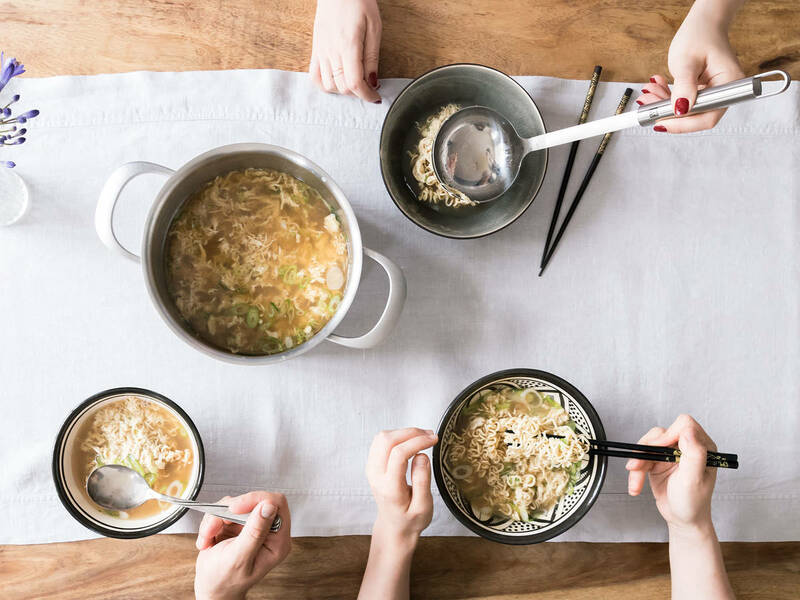 If you’ve ever dreamed of having bowlful of the steaming chicken broth with the signature egg spun through—without having to leave the house—the Kitchen Stories community has just made it possible. Thanks to our user Irina Panarina you’ll learn how to cook this classic dish at home, with an extra-satisfying addition to the original. Sometimes it’s the simplest things in life that are best—and the same goes for cooking. I could hardly name another soup that’s easier, quicker (and also cheaper) to prepare: All you need are 5 ingredients and 15 minutes preparation time. That’s exactly what makes this egg drop soup the ultimate comfort food for when it’s stormy and rainy outside, when you’re sick in bed—or whenever you need something warming in a flash. To make her recipe even more satisfying, Irina adds egg noodles for a little extra sustenance. Similar dishes to the egg drop soup can be found in plenty of international cuisines. The best known one is probably the Italian ‘Stracciatella’ (no, we’re not talking about the ice cream) with Parmesan cheese and spinach. In Austria, ‘Eierflöckchensuppe’ is a well-known recipe that’s served up for those under the weather or to young children. The egg is thickened with flour and resembles scrambled eggs. To name a couple more, there’s the French garlic soup ‘Le Tourin’ and the Spanish ‘Sopa de ajo’, with its egg-white broth. Let us know your local variant in the comments! As you’ve probably noticed by, the combination of chicken broth, eggs and spices is just the beginning and you can easily experiment to create your favorite version. For example, if you’re vegetarian, simply replace the chicken stock with vegetable broth. Additional toppings or ingredients can be chosen based on personal taste. As shown in our community recipe, egg noodles are a great option to make this soup even more substantial, but you can also add dumplings of your choice. And how about some diced tofu, corn, or mushrooms? To give the broth a more intense flavor and added depth, add spices like star anise or a cinnamon stick (but make sure to remove them before eating). Adding some starch to the broth and eggs will help to thicken the soup a bit and make the egg extra silky. We’re excited to see which combinations or new ideas you come up—or whether you prefer stick to the original. Enjoy! Have you got more comforting recipes up your sleeve? Why not share them with the Kitchen Stories team and our hungry community! Simply send your recipe to community@kitchenstories.com. What Is Bone Broth and Should I Be Drinking It?